Fact #1. These are Wayne County's two best and tradition laden basketball programs, and they'll write another chapter in their storied rivalry this Friday night in front of a packed house at Wooster High. Fact #2. Orrville wants to beat Triway, and Triway wants to beat Orrville. According to each team's fans, their team has NEVER committed a foul, and the refs are always in the back pockets of the other team. So it should be an entertaining night to say the least. Fact #3. There is mutual respect between the players and coaches, on both sides...that SHOULD set an example as to how we, as adults, should behave, but that goodwill probably wont last past the tip off. Fact #4. Both teams want to prove that a losing record doesn't mean you're a bad team.....and what more affirmation that to leave the gym Friday night with a district title medal around your neck. I'm not here to fan the flames because they need no fanning....but I am here to talk about a game (just a game) between two proud communities that will hopefully highlight the good of both schools, and the good of Wayne Co. basketball. Wouldn't it be something if Orrville wins a district title...on Wooster's home floor, against one of their biggest rivals in Triway, less than a week after the Orrville girls won their own district title on Triway's home floor? I'm sure Triway wouldn't mind wearing the district champs crown on Wooster's home floor either, especially if it comes at the expense of Orrville. Lots to play for, lots to prove. Funny how expectations change so quickly for both. Should be a great matchup. One other little wrinkle to this matchup, Andrew and I have been doing these picks all tournament long, and if I need to remind you, he's a Triway fan. I don't think either of us thought we'd see an Orrville/Triway district final matchup.....but here we are. That said, Let's get to it. Visitors first....take it away, Andrew. Andrew's thoughts: What else needs to be said about this match-up? 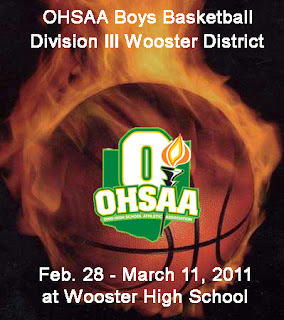 This is the 3rd time since 2005 that these two teams have met in the District Championship. In the first two meetings (2005, 2010), the regular season winner lost the district championship game, and the district champion went on to be the state runner-up. There's no denying the tradition that these two schools bring with them when the tournament starts. Speaking of tradition, Triway has made the district championship game in 6 of the last 7 years, and 10 of the last 14. Orrville's height could pose big problems for the Titans again, but the purple and white seem to be playing well as a team right now too, both inside and outside. I expect a huge crowd and an exciting game! Get there early! Go Titans! Tim's thoughts: Riders CAN'T let Triway stall the ball. We have the athletes and the bodies down low to negate the effectiveness of the Triway spread. Coach Snoddy will use a similar logic against Zach Wasson that he used against Northwestern's Brennan McKean....he wont let 1 guy beat him. Zach's been used to double teams all season so nothing will surprise him, but expect Triway to pack in the zone and dare Orrville to shoot over them. Maybe they foul the daylights out of our big men and make us earn it at the foul line. Who knows. But I do know Snoddy won't let us run up and down the court or dictate tempo. "I guess there's only one thing left to do....win the whole dang thing." Riders have won by 25, 6 and 4 in their first three tournament games. If that pattern is any guide, Rider fans better get their antacid out. I can't see this game being anything more than a possession by possession game that comes down to the final 2 minutes. I think in the end, the Riders are just good enough. Back to the Fieldhousem who'd have thought that a few weeks ago. Go Riders! I'll echo Andrew's comment about getting there early. Gates open at 6pm, tip off at 7pm. I'll bet a line forms outside the doors too. If you want a good seat, get there early. Winner advances to the Canton Fieldhouse to face the winner of the Salem district championship between Campbell Memorial and Youngstown Ursuline on Weds. March 16th at 6:15pm. only thing missing in this game is a winning record. sorry, guys, it's hard to get excited about a pair of sub .500 teams, no matter what the circumstances. You missed a good game between two storied programs. No matter their record, it's still Orrville vs. Triway.